This is one of my favorite reviews/giveaways so far. I got to choose a piece of jewelry from the Jewelry Stylist. I chose these 3 row tear drop earrings. I wore them the day I got them in the mail. They are so cute and classy! The company sells the most beautiful jewelry. It is perfect for brides, bridesmaids, prom, etc. I just wish that I knew about this company when I was getting married to find very affordable gorgeous jewelry. 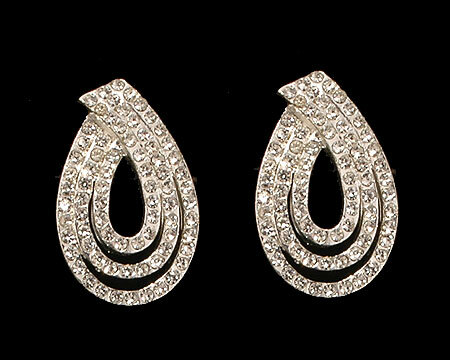 Giveaway: I will be giving away a pair of these beautiful earrings to one lucky reader! The contest is open until midnight Saturday August 14th. The winner will be chosen on Sunday August 15 via Random.org. Mandatory: Visit Jewelry Stylist and tell me your favorite piece of jewelry. -Follow Jewelry Stylist on Twitter (1 entry). -Fan Jewelry Stylist on Facebook (1 entry). My favorite is the pink pearl neclace. following Jewerly Stylist on twitter. liked Jewelry Stylist on fb. I am entered in your Trading Phrases giveaway. I am entered in your Missiko Hair Care giveway. I love their White, gunmetal, platinum and pink pearl beaded necklace. I became a fan of them on FB. I LOVE those earrings! I also like the Fun/Flirty White Pearl 60" Necklace. I like the Electric Blue Crystal Earrings with Silver :-). You're on my blogroll, and I just started following you through Google Friend Connect! I found your site after you commented on mine! I entered the trading phrases wall decal giveaway! My favorite are the Clear Crystal Chandelier Earrings. I entered the Trading Phrases giveaway. I like the Azalea Pink Crystal Earrings with Silver (Medium). Thanks for the review and giveaway! I like the white button pearl earrings. I love the Matte silver link earrings. I found your site through Giveaway Scout. I entered the Mangroomer Body Shaver giveaway. found your site in a friend's blog. Oh! They have so pretty things! I like them all!!! I love brown though and would love to have the Light Gold, Taupe and Bronze Pearl Necklace (10mm) (brown). I found your giveway on a giveaway linky at Mass Hole Mommy! For the earring giveaway I love the Smokey Topaz and Gold Rhinestone Bracelet (Brown)! Although everything is beautiful! I entered your "right on the walls" giveaway. I would love to have the Azalea Pink Crystal Earrings. I found you through One 2 Try. I like the Black and Rhinestone V drop Necklace. I am following JewelryStylist1 on twitter as sassydeafdiva. I love the black Austrian crystal drop earrings!! Found you on a blog hop!! Purple faceted antique crystal gold chandelier earrings, wow! I too, entered your Right on Walls giveaway! I found you on Fun Friday Links! I like the purple crystal drop earrings! You found me on FMBT! I entered the Mangroomer giveaway! I visited the site and really like the Marcasite Bracelet w/Onyx and Rhinestones bracelet. I found you through a Saturday blog party. I signed up to follow because I like your Friday diet tips.